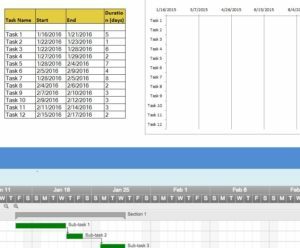 If you’re in need of a new way to bring your project from mere concept to an actual plan of action, the Customizable Timeline Sheet is just the template you need. There is no better feeling in the world than being well prepared for a major project. This template gives you a way to enter every great idea you have and form it into the perfect plan to complete any goal you have in mind. Don’t let your great ideas stay ideas. Use this free template to create a plan that works for you because no one knows your business better. To download the free template to your computer just follow the link provided below. The Customizable Timeline Template allows you to separate your ultimate goal into separate and easy to accomplish tasks. As you make your way through the timeline you’ll be able to watch yourself get closer and closer to your goal. The first thing you’ll notice is the yellow table to the left of the screen. This is where you will enter all your information for your goal timeline. The Timeline Sheet template was designed to be intuitive and easy to follow. In the first column of the table enter the name of your task. Then you will include the start and end dates for your tasks. Be sure to use the same format as the example given to you. The final thing you’ll need to enter is the total duration of each task. If you are planning on a company trip and need to hold a fundraiser as one of your first tasks, you can list the number of days you want to hold the fundraiser in this section. Now, watch as all your information is instantly applied to the graph on the right. When you see a task coming up you’ll have ample time to prepare for the road ahead.